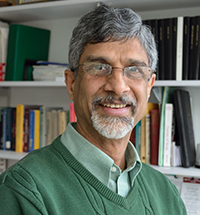 After receiving Ph.D. from North Carolina State University in 1984 Dr. Netravali joined the Department of Materials Science and Engineering at Cornell University as a postdoctoral associate. In 1985 he joined the Department of Mechanical Engineering as a research associate and in 1987 he joined the Department of Fiber Science & Apparel Design (FSAD) as an Assistant Professor of Fiber Science. At present he is the Jean and Douglas McLean Professor of Fiber Science. His current research is in the areas of Fiber Reinforced Composites and Green Materials and Processes. In composites, the primary focus of his research group is to develop sustainable and environment-friendly resins from plant-derived proteins and starches and to fabricate Green Composites, using plant based reinforcements. These carbon-neutral ‘green’ composites have properties comparable to conventional petroleum-based composites. However, unlike conventional composites which end up in landfills, green composites are biodegradable and can be composted at the end of their intended life. In the past few years, his research group has developed green composites with excellent mechanical properties. His group has also prepared Advanced Green Composites with high strength and toughness that may be used in some structural and ballistic applications, Toughened Green Composites as well as Self-healing Green Composites that can repair themselves autonomously to extend their working life and Fire resistant Green Composites. The second focus of his group is modification of fiber surfaces to control fiber/resin interface characteristics in composites. His research group has used many techniques including polymerizing and non-polymerizing plasmas, pulsed excimer laser, high power ion beam, solvent treatments, etc., to modify fiber surface chemistry and topography to fine-tune their adhesion to resins and, thus, to control the composite properties. A third focus of his group is developing green chemical processes to obtain functional properties in cotton and woolen fabrics. His group has developed green technologies to obtain ultra-hydrophobic and anti-wrinkle cotton fabrics as well as treatments for hair stabilization and strengthening wool fibers. High strength fiber reinforced plastics or Advanced Composites are used in many applications including aerospace and automobiles because of their excellent mechanical properties combined with much lower density compared to metals. Most high strength fibers and resins used in advanced composites are derived from petroleum, a non-renewable resource that is projected to last only a few decades at the current rate of consumption. Further, these composites do not degrade in natural environment. With high production growth due to expanding applications of composites in the past 2-3 decades, their disposal at the end of their useful life has become difficult as well as expensive. Composites, made by bonding two dissimilar materials, particularly those using thermoset resins, are difficult to be recycled or reused in any other application. While only a small fraction of the composite waste is ground into powder for use as low grade filler or incinerated to recover energy, most of the composites end up in landfills. Major part of our research is directed towards creating fully sustainable and environment-friendly ‘green’ resins and composites using yearly renewable plant based polymers and fibers that are also carbon neutral. At the end of their life green composites can be easily composted to create organic soil which can help grow more plants. Green composites based on plant proteins or starches and fibers developed by our group are suitable for use in packaging, housing or transportation panels, furniture, board sports and secondary structural applications. We have also developed Advanced Green Composites using liquid crystalline cellulose (LCC) fibers that have high mechanical properties. Some advanced green composites made using modified LCC fibers have high strength and stiffness and can be suitable for primary structural components. Second part of our research is in the field of conventional Advanced Composites made using high strength fibers such as graphite, aramids and ultra-high molecular weight polyethylene (UHMWPE) that are used in a wide range of applications from aerospace to sports gear and from automobile body parts to civil structures. Critical mechanical properties of composites such as toughness and longitudinal and transverse strength are controlled by fiber/resin interfacial bonding. My research group is involved in modifying fiber surface topography and chemistry to control their adhesion to different resins. We have used many techniques including polymerizing and non-polymerizing plasmas, pulsed excimer laser, high power ion beam, solvent treatments and their combinations to obtain desired chemical groups on the fiber surface and obtain desired surface roughness to fine-tune the fiber/resin interfacial bonding. We are also able to control resin and fiber/resin interfacial properties adding nanoparticles and nanofibrils in the resin. Our group has been involved in producing randomly oriented and aligned bacterial cellulose (BC) nanofibers using food and agricultural wastes for applications in medicine, filtration as well as green composites. Our latest research involves developing new environment-friendly processes and technologies based on Green Chemistry principles to obtain hydrophobic, ultra-hydrophobic and anti-wrinkle characteristics in cotton. We have also developed technologies for hair stabilization and enhancing strength of wool fibers. Advanced Green Composites, Netravali, A. N., (Ed. ), Scrivener Publishing, Beverly, MA, and John Wiley & Sons, Inc., Hoboken, NJ, 2018. Interface/Interphase in Polymer Nanocomposites, Netravali, A. N. and Mittal, K. L., (Eds. ), Scrivener Publishing, Beverly, MA, and John Wiley & Sons, Inc., Hoboken, NJ, 2017. Qiu, K. and Netravali, A. N., In-situ produced bacterial cellulose nanofiber based hybrids for nanocomposites, Fibers, 5(3), pp 31, 2017. DOI: 10.3390/fib5030031. Dr. Netravali is a member of the American Chemical Society, the Fiber Society, American Association of Textile Chemists and Colorists (AATCC) and the American Nano Society. He is an Adjunct Professor in the Department of Materials Science & Engineering at Tuskegee University, Tuskegee, AL. He has also been a member of the Engineering Panel of the Research Grants Council (RGC) of Hong Kong since 2013. He is the Editor of Reviews of Adhesion and Adhesives - Open Access Supplement (RAA-OAS) and an Associate Editor of AATCC Journal of Research. Additionally, he serves on the Editorial Advisory Boards of six research journals; Composites Science and Technology (CST), Journal of Biobased Materials and Bioenergy (JBMBE), Journal of Renewable Materials (JRM), Journal of Engineered Fibers and Fabrics (JEFF), Fibers, and Textile Research Journal (TRJ). He is a founding member and a member of the Advisory Committee of the International Conference on Green Composites. He is also a Faculty Fellow at the David R. Atkinson Center for a Sustainable Future at Cornell University. - I am a member of the Cornell Center for Materials Research (CCMR) and work through them on their outreach activities. - I am a Faculty Fellow at the Atkinson Center for Sustainable Future (ACSF) and participate in some of their activities related to sustainability. - I have made several presentations to different Cornell groups and visitors and others in the state of NY as well as worldwide on my research in Environment-Friendly Green Materials and their applications. - I have presented several lectures on ‘Green Materials and Processes’ to the visiting business leaders and educators through the Agribusiness Management Program (CALS) on using agricultural and food wastes into value added products. This has opened up possibilities for collaborations with industries or licensing of Cornell technologies. I have taught FSAD 1350, Fibers, Fabrics and Finishes, for freshmen in FSAD for several years. This is a required course for all FSAD students. About half the students in this course come from other departments within the College of Human Ecology or other colleges across the campus. Even students from outside Cornell take the course to fulfill their science requirement. The course introduces the students to properties of natural and synthetic fibers, production and properties of yarns and fabrics as well as dyeing and finishing of fabrics. Teaching this course is always a challenge because of the diverse interests and backgrounds of the students. I teach students both conventional and new green/sustainable materials, conventional fiber applications and the latest innovations in the field as well as new technologies/applications of fibers. FSAD 1360, Fiber and Yarn Analysis Laboratory, a 1-credit course consisting of several lab sessions is taught along with FSAD 1350. In this course students learn techniques to identify and characterize fibers, yarns and fabrics. This course is restricted to FSAD students but those from other colleges interested in transferring into FSAD program also attend. I also teach FSAD 3350, Fiber Science, at the junior level. This course is designed for the students in the Fiber Science option but is also a recommended elective for Materials Science and Engineering (MSE) and Chemical and Biomolecular Engineering (CBE). However, students from other colleges as well as other departments in CHE have also taken this course. FSAD 3350 also has lab sections for characterizing various fiber properties. This course has been particularly useful in attracting engineering students into Fiber Science program. Many MSE and CBE students have done research in my group in the past few years. Many MSE students have taken the advantage of the Fiber Science minor which was launched a few years ago. At the graduate level, I have also taught FSAD 6200, Physical Properties of Fiber Forming Polymers and Fibers. It is a theoretical course that discusses properties of polymers and relationship between fiber structure/morphology, fiber chemistry and their physical properties. Thermal, mechanical and other properties of fibers and methods of characterizing them are also discussed. While this course is meant for graduate students in FSAD, students from other colleges, particularly engineering, also take it. Ongoing teaching goals are to refine and strengthen course contents for all three courses while incorporating the latest research into FSAD 6200 and FSAD 3350. When possible, I also invite industrial and academic guest lecturers to give students the opportunity to get the outside perspective. Guest speakers many times also serve as future contacts for students during their job searches or higher studies. I also have a large collection of interesting specimens to show in the classes I teach. Students, particularly undergrads, always appreciate such real life examples in the class as it helps connect the theory to the real life situations.